I've just installed a new set of Formula Oro K24 brakes on my Giant hardtail. I've taken the bike out for a test run and, while the brakes will lock up the wheel, they seem to lack proper modulation. This is especially true for the rear brake, which require compression of the lever nearly all the way to my other fingers that are resting on the handle bar grip. Is this just normal behavior of brakes that are not completely bedded-in? I've fiddled with the FCS lever and the brake lever position screw, neither of which helped much. I've also bled the rear brake. I am just expecting too much too soon? Does modulation improve as the pads bed-in? Chris here from Formula Brake USA / Perigeum Development. Whenever you have questions about your brakes or need tech help, just give us a call in the office at 707.765.2770 and we will be happy to help diagnose and solve any issues you are having or answer questions. I've installed Oro K24's on two different bikes of mine this year. The stopping power improves as they bed in, but you should get very good modulation right from the start. From the sound of it, especially with the rear brake lever being near the bar, you may have air in the lines. That will play havoc with modulation and stopping power. I replaced the rear hose on one set of my K24s with a longer hose, and had to bleed it two different times to get it set right. You may want to give both of them another bleed just to be sure. If the rear lever comes almost to the bar, you may want to adjust it. Both levers have small allen screws that will adjust positioning. I tend to turn mine way out, but that's personal preference. They do improve as they bed it, but should be pretty good from the get go. 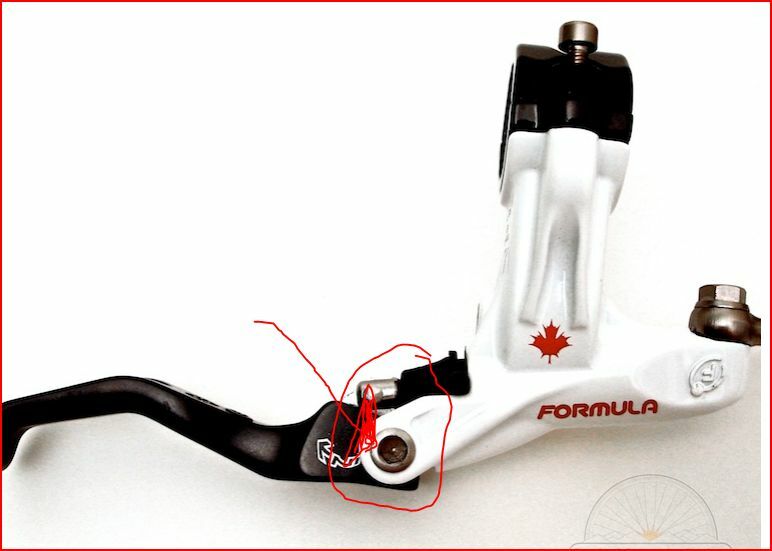 Is this the screw to adjust the positioning of the levers? And is it normal for the brakes to squel/rub the rotor when it is brand new? I installed it and aligned the caliper by spinning the wheels, squeeze the lever and tightened the screws on the caliper to the adapter. I did that a few times and can hear the brake pad and rotor are rubbing each time. Will that go away once it is bed in? thanks ahead. The adjustment screw that he is refering to is onthe bottow(toward the ground) side of the lever. I have the same brakes, and I felt the same probelm. I could pull the lever almost all the way to the bar. Turning the screw out changes the feel of the brake ALOT. Once you bed them in they are great, and have a ton of braking power.